Grant PUD will enhance power meters across the county so they can be read, started and stopped remotely. This program will reach completion in 2019 and help us drive efficiency, keep prices low, and provide more responsive customer service. The manual operation of our 50,000 existing meters requires Grant PUD employees to make at least one in-person visit to every business and residence across the county, month after month, year after year. 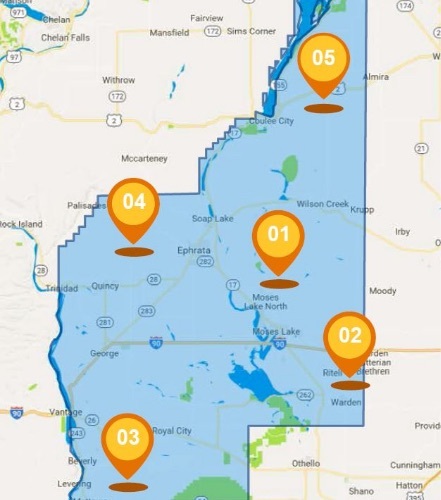 With advanced metering, Grant County PUD will be able to read data generated by any meter in our county—all without leaving the office. We’ll save money by gaining efficiency, and pass those savings on to our customers. AMP will also give us the ability to better identify and respond to outages. 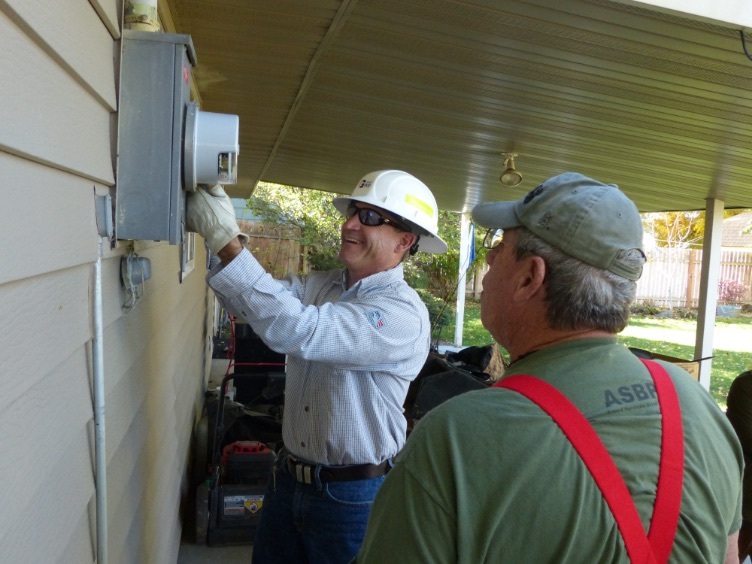 If an outage occurs, our advanced meters will help us locate the problem and restore power more quickly. 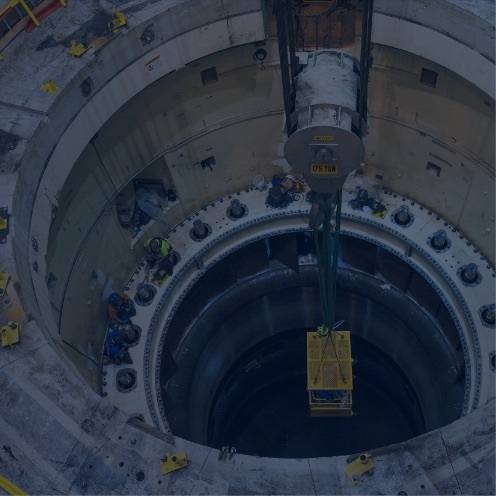 We expect the project to pay for itself in just six years. Over a 10-year period, we estimate that advanced metering will result in a cumulative savings of $35.6 million—an excellent return on investment that will enable us to keep providing low-cost energy to our customers. 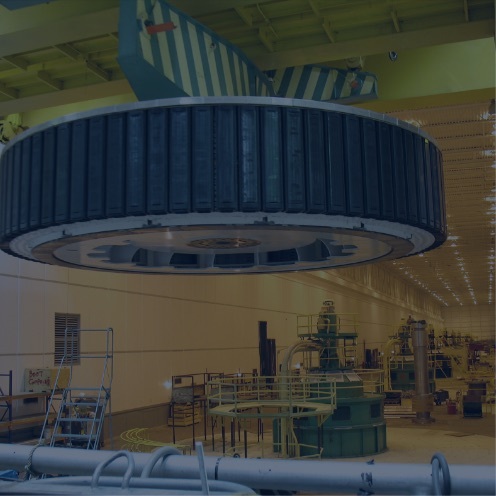 Our transition to advanced metering began in the Moses Lake area in September of 2017. 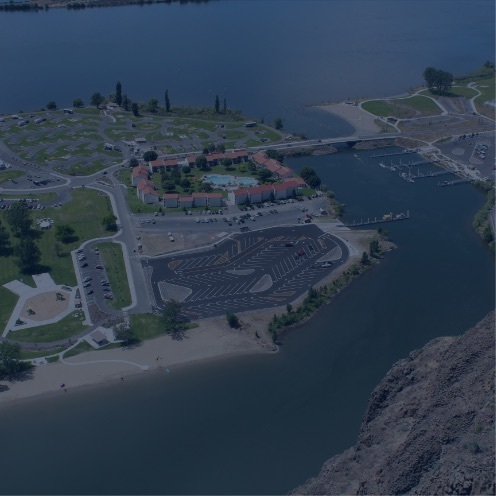 We have expanded south to Warden and north to Grand Coulee, followed by a westward push to the Mattawa and Royal slopes, before heading north to the Quincy Valley, Ephrata, Soap Lake areas and finishing in the Coulee City region. We expect to achieve full adoption of advanced metering technology across Grant County in 2019. 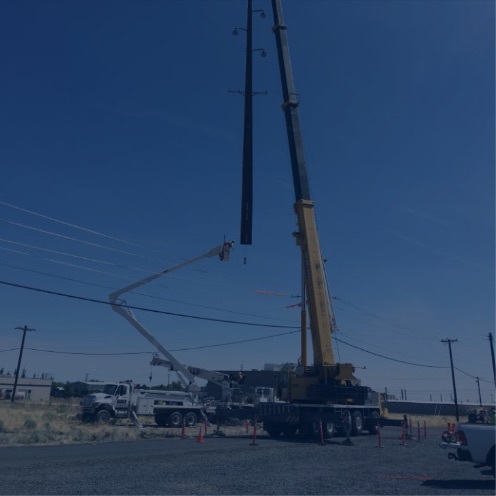 Our transition to advanced metering began in the Moses Lake area in September of 2017. We've now expand south to Warden and north in Grand Coulee, followed by a westward push to the Mattawa and Royal Slopes and are heading north to the Quincy Valley, Ephrata, Soap Lake areas and finishing in the Coulee City region. We expect to achieve full adoption of advanced metering technology across Grant County in 2019. How much will this technology cost? Grant County PUD plans to invest $14.9 million over the next three years to upgrade our 50,000 existing meters. The project will pay for itself in just six years. Over a 10-year period, we estimate that advanced metering will result in a cumulative savings of $35.6 million—an excellent return on investment that will enable us to keep providing low-cost energy to our customers. This is a proven and practical technology. Advanced metering is well-established around the world, with more than 50 million advanced meters in the United States alone. AMP will help the PUD keep our customers’ rates affordable for years to come. How will this affect my monthly bill? You won’t notice much of a change on the bill you receive each month. You’ll still receive your regular monthly bill—and it will still be due 25 days after it is sent to you. What will change is that you will now receive the most accurate, timely meter read possible. At pre-determined, regular intervals, your meter will send the PUD data on how much energy you’ve consumed, eliminating the need for a PUD employee to manually read the meter. This communication directly from the meter to the PUD takes only a few seconds per day and will give us more accurate and timely information about your energy use. Do these new meters make it easier for someone to steal power from me? When energy theft occurs, we all lose. Advanced metering makes it easier for Grant PUD to identify and prevent energy theft—for example, when someone tampers with a meter or connects to our system without authorization. Are the new meters safe? Yes. Advanced meters are designed to regularly send a few short messages every day through a secure digital communications system. The signal will only last for a few seconds during a typical transmission. A person will be exposed to a higher level of radio frequency in one 30-minute wireless phone call than in 20 years of exposure to our new metering system. Will my data remain private? Yes. Grant County PUD abides by stringent policies protecting the privacy and security of your electronic usage data. Meter readings and other meter data will be transmitted over a secure gateway to our office. And because we’ll no longer need to make regular home visits to every customer in the county, you’ll have a bit more personal privacy, too. Do I have the option to continue having my meter read manually? We are providing a manual meter-reading service to customers who wish to pay for it. The cost of this program reflects the time and expense involved in sending employees to manually read the older devices. The cost to have the radio-read portion of the meter disabled is a one-time fee of $250.99 and then an on-going fee of $64.34 a month for a meter reader to continue reading the meter. These costs will be reviewed annually. What kind of radio signal is used? Our AMP meters operate by transmitting a radio frequency back to a central location. When they are transmitting, with a signal that lasts for just a few seconds, the meters emit approximately 1,000 times less RF than a wireless telephone. 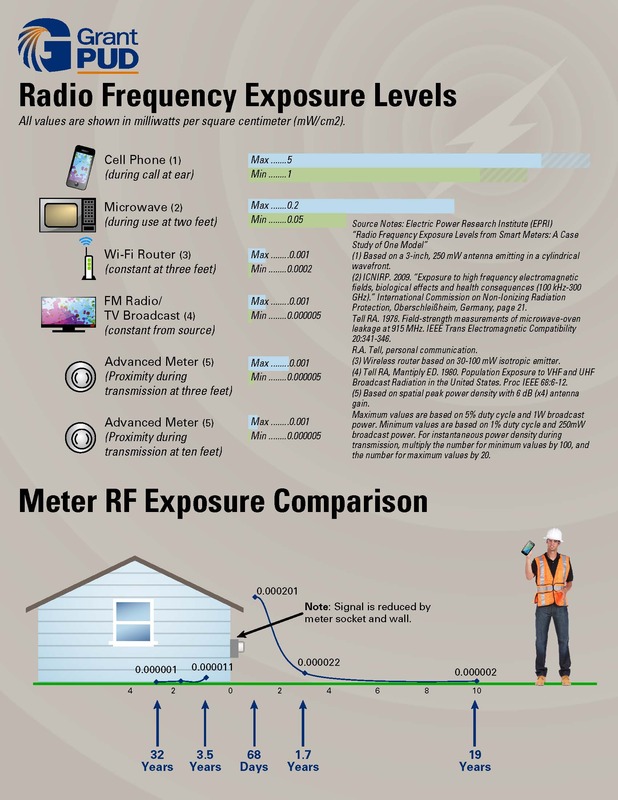 A person is exposed to more RF in a single 30-minute cell phone call then they would receive over 20 years from an AMP meter.